You may recall that Sister of Pyjamas gave me some recipe books for Christmas. Baking books. Funny. Rarely, if ever, do I turn out anything that involves using flour and eggs and the term "folding" that ultimately looks like the picture in the book. I don't fold . I beat the crud out of things. For me , baking is like being a Gladiator. We fight to the death, and it's almost always the baked goods that lose. One of my goals for 2012 is to work my way through one of those books and cook at least half the recipes. You'll notice I didn't add the word "successfully" to the goal. But somewhere inside my head that's what I'm aiming for. My mantra for 2012 is there is no such word as "cant". There must be an inner Julia Child or Nigella in me somewhere. So, last week I girded my loins and made my first batch of whoopie pies. Chocolate. And according to my recipe book this is what they are supposed to look like. And this is what most of mine looked like . Frisbees. Crunchy Frisbees. They were too flat. Aren't these things supposed to be puffy like cake? I took them to Claire's last Saturday and tried to feed them to my unsuspecting Farmers Wife Quilt group. Only Loz and I were brave enough to eat them. They did taste really good though once I'd put so much buttercream in them I could feel my arteries hardening every single time I took a bite. Not to be deterred by less than 100% success today I decided it was time to give them another go. 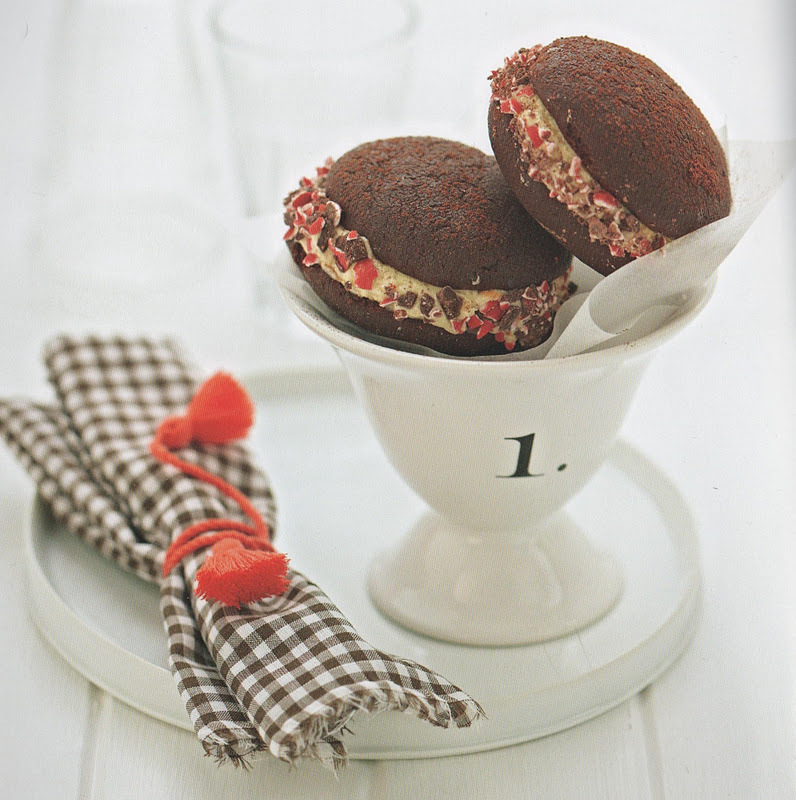 Maybe mastering Whoopie Pies takes more than one try. I settled on Jaffa Whoopie Pies because I had plenty of last weeks chocolate butter cream left over. On a side note I put just about everything in my freezer including leftover icing but I'm just not good at labelling stuff. I know what it is ..but nobody else does. It's made for some hilarious moments when someone pulls out chocolate icing thinking it's gravy. Thankfully no piping was involved today . The recipe said I could just put tablespoon fulls on my biscuit trays. That saved me having to wipe cookie dough off my ceiling which is where some of it ended from last weeks great piping accident. I'm not very coordinated. Fooled you didn't I? This is what they are meant to look like. Mine didn't look anything like that. Mine were mutant sized. The size of baseballs. They had too much puff like cake. And my jaffas wouldn't crush properly because it's currently about 110F. They just kind of melted into one another and I had to push them into the icing. While Mr. P was appreciative and made Mmmmm noises while munching on one, I just can't shake the feeling that I'm Goldilocks. She was a fussy perfectionist cow too. 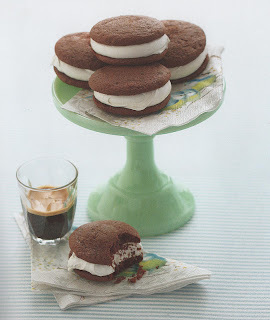 Next week I'm hoping my whoopie pies will be just right. I may give the chocolate ones a miss and move onto something else since chocolate appears to be waging a personal vendetta against me. I immediately reverted to something I know I'm good at and I redeemed myself with the roast duck I did for dinner....sublime. PS. Don't tell Little P - his favourite animal in the "Old McDonald had a farm"song is the Duck. I'd hate for him to have to spend years in therapy. Those whoopie pies were awesome......looks aren't everything you know! nearly damped my rompers reading this post - BRILL! I was not fooled by that photo, no, no, no. Though I momentarily thought if it was legit, I might have to unfollow you. Thankfully, looks are not important in home baking, it's all about the taste (and megapoints for effort--you made them twice!). Yours looked like they tasted fantastic. I'm assuming Jaffas are like M&Ms? Looking forward to your next creation! You and chocolate are not friends any more? What is the world coming to? I reckon the whole whoopie phenomena needs ignoring. Until recently I had never ever seen one. Now they're every where. Well, not in real life. Just a lot of photos, and you know how trustworthy photos are these days. Probably ALL whoopies look like yours, they are just photoshopped. A little puffiness edited here, a little extra put on the frisbee ones there - you get the picture. All to give you a Goldilocks complex! It's not right!!! I'm sure the next time they will be "just right". I am amazed that you keep trying. I would have given up and moved on the to the next recipe, but you persevere. Good luck with that. I just want to know .. who wears rompers? and what the heck are they? and yes, "jaffas" ? are they candy related to coffee (java)? Inquiring minds want to know. I made some cookie dough last night - packet mix sure, but points for the effort. I made 3 actual cookes, just to see if maybe by some strange twist of fate they'd come out okay, but as usual they were a disappointment so I ate half the remaining dough and put what was left in the fridge for later. You make a lovely duck! You just need more practice on the other things. Oh well, so long as they taste good.....mothers loves all their kids, even the ugly ones......but the duck certainly looks yummy. I hope you gave yourself an A for effort. Maybe the presentation is a little off, but if they taste good, you've done well. Wouldn't it be worse if they looked great and tasted yucky? We won't discuss my last round with chocolate chip cookies. DT hasn't let me live that one down yet. Love duck! Could you pop over and do Sunday lunch for us please? Baking is easy least. First, buy yourself a Kitchen Aid. I got heaps better when I got one of those! My previous comment is supposed to say easy peasy not easy least. Stupid auto correct!! I think your jaffa ones look pretty good actually, I wouldnt even attempt anything like that, my baking skills leave a lot to be desired. The duck looks delectable! Why is it that the photos in the recipe books look amazing and when we try it they look nothing like it??? Notice I never said anything about your first photo....ROTFL ;-) I'm with you sister but I would have given up. I did once want to do macaroons but haven't been brave enough yet. What is it with baking? I can do a mean roast too, never tried duck. Wonder if the kids would eat it? Really, I'm not a big fan of baking. It is a lot of work, creates way too many dirty dishes and is really fiddly for something that gets eaten in 12.5 seconds. I'd much rather buy my baked goods. I prefer cooking. You are you are young. You have time. You need a neighbour like I had once he knew that I baked at the weekends and always found an excuse to visit my husband for a chat....but knew he would get to eat my flops.....he loved flops for some strange reason.. even the ravenous kids would not eat them but he scoffed them. As long as they taste alright does it really matter what they look like. Never cooked duck don't think it would go down to well here but it looks delicious. I've seen these on the woollies shelf in a pkt form...that would be my way of making them. I think your 2nd attempt look pretty good I would Eat One for Sure..
LOL what a crack up about the Duck & Little P..ROFLMAO.. I'm sorry Shay, I tried really hard not to laugh but one sneaked out - especially at the second attempt. But - looks aren't everything - at least that's my motto and I'm sticking to it - and it's not in the looking, it's in the eating - I'm sure they tasted lovely. Yours are just a little - um, rustic - but I'm a rustic baker myself so it all good as far as I'm concerned! I've just had a complaint from the otehr half that I'm being too noisy - all that laughing. I think you and I went to the same school of baking. Tomorrow I have to make a Victoria sponge and some muffins. Watch this space. And I too will henceforth "dampen my rompers"! I don't know I think I would have one if offered....obviously they didn't make you go "whoopie!!!" Love the jaffas. Yours certainly have substance. I cannot stop laughing and I can't even cook. Hilarious! That duck looks awesome. Did you tell little P. it was beef. You brave, determined woman, you! Making them twice? Incredible! It would take me a year to revisit them! And they both looked awesome, probably because I'm the only person on earth who loves crunchy cakes. My mother-in-law is a whoopie pie QUEEN and my husband grew up on her homemade masterpieces, so I've never attempted. That would be just silly. I want one now. May have to settle for a gas station knock-off. p.s. I always want to be a first commenter on one of your posts, and I'm ALWAYS in the 20s! Yesterday it hit me - uhhhhh, duh, we're in totally different time zones. Those girls have the whole "it's not the middle of the night for them" thing over me. Humph. 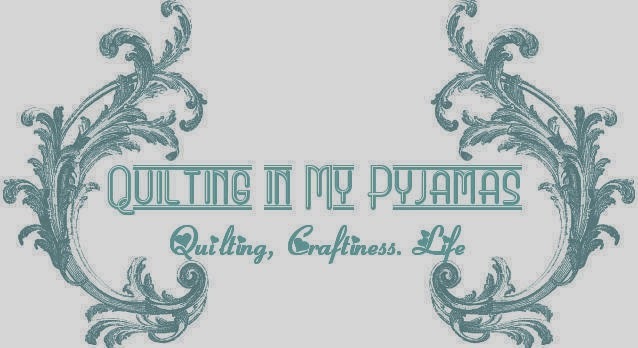 One night I'll stay up and hit refresh on QiMP over and over until you post and I WILL BE FIRST! I don't know, those fluffy ones look pretty yummy! As for the others, I bet they tasted great. You're just not supposed to tell what you were shooting for and pretend that's what you intended. I've never actually had a whoopie pie and certainly would never attempt to bake one, but think you're very brave to attempt same. I bake cookies, brownies, and an occasional cheesecake, and those only rarely. Goldilocks as a cow, love it!